Joanne Green and Brendon Keenan are the artistic and soulful members of Almost Blue. Photo credit: Steve Goff. You’ve doubtless seen the colorful and attractive posters, designed by Steve Goff, advertising Almost Blue shows on your perambulations through downtown. The artistic jazz duo consists of Joanne Green on vocals and Brendon Keenan on guitar. 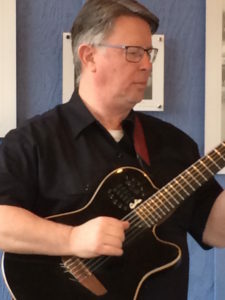 Joanne and Brendon met at one of Traditions’ Jazz Jam Sessions, which happen on the first Sunday of the month, and began playing together at them, as well as at jazz nights at various bars in town. In 2014, Joanne suggested they form a band together. They put together a repertoire and a short video for demos and landed their very first gig at the Pig Bar. A former lawyer, Joanne played in a number of bands on the side, mostly singing blues and R&B, and became increasingly aware of how much more she preferred performing to practicing law. “I was in a Top 40 rock and roll cover band, but I don’t like to talk about it,” Joanne jokes. “It’s part of the dues paying.” Almost Blue is Joanne’s first project that she can call her own, before that she was always a part of other people’s projects. Brendon has a long and diverse history as a performer. He’s played shows, cruise ships, rock bands and cover bands, variety bands and Latin music. Brendon’s mother was a singer, guitar player, and pianist and taught Brendon guitar at a young age. “I wanted to play The Beatles and the Rolling Stones, so she got me started and then I just figured it out,” Brendon shares. Joanne’s roots in music are also deep. “I started playing piano when I was five,” she says. “My mother was a teacher.” From there she joined the choir in high school, but it wasn’t until law school, after years of singing as part of a group, that she overcame her stage fright and performed solo for the first time at a talent show. “I was transformed,” Joanne recalls. “All the lights were on me, so I couldn’t see anybody in the audience.” Since then, Joanne hasn’t gotten stage fright. The name for the band was Joanne’s idea. “Almost Blue” is the title of an Elvis Costello song, made famous by Chet Baker’s sultry performance on trumpet. “I like the name because it indicates that we’re jazzy, but also bluesy,” Brendon says. “There are a lot of jazz people who think that blues is beneath them because blues is a simpler form,” Joanne adds, “but Brendon respects it, and I love to sing it.” So the name indicates that the band plays jazz, while paying tribute to the genre’s roots in blues. Joanne’s favorite songs to perform are jazz ballads (think “Skylark” and “But Beautiful”) and bluesy standards like “Do Nothin’ Till You Hear From Me” because they make the most of her warm, sad voice. “I can break your heart,” she says, quite truthfully. Brendon loves to play songs that move, like “I Thought About You” and “You’d be So Nice to Come Home To.” “What I like best is swing that swings pretty hard,” he says. While you can catch Almost Blue at many different local venues—they play the Oyster House, Dillinger’s, Ben Moore’s, and Cascadia Grill and Jeremy’s Farm to Table, among others—their favorite places to play are senior housing centers because the audience loves their music there. “There’s nothing like playing to an audience that appreciates you,” says Brendon. To find out where and when Almost Blue are playing next, you can visit the Almost Blue Facebook page. 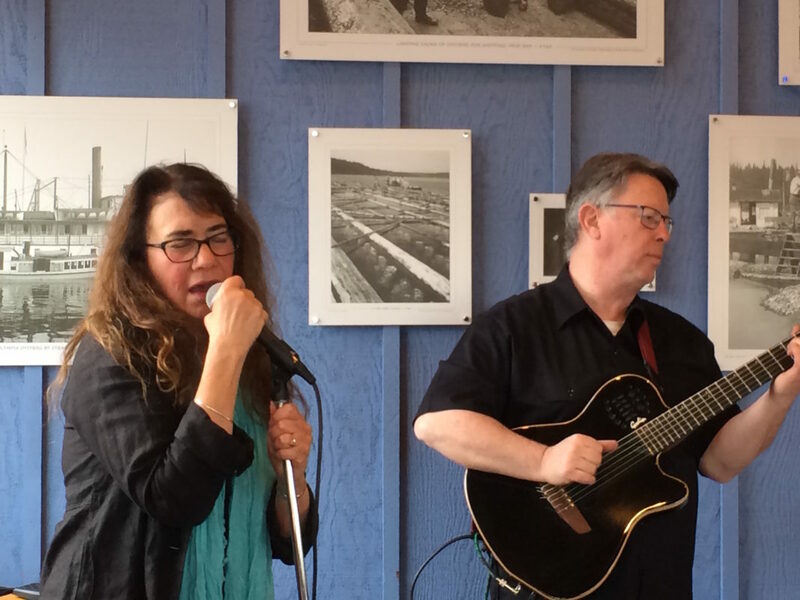 Almost Blue also has a CD for sale, which you can purchase by contacting Joanne at olyjoanne@comcast.net. They are available for private gigs too.